Each year as Christmas approaches we take a trip to visit Santa. We visit somewhere different each year and make a day of it. This year we visited Clearwell Caves in Coleford. "Clearwell Caves are natural caves, extensively mined for iron ore to make some of Britain's most complex and oldest mine workings. The mine dates back well over 4,000 years, when early miners dug for ochre pigments to make paints. Iron ore miners later created a warren of underground passageways, by connecting huge caverns." 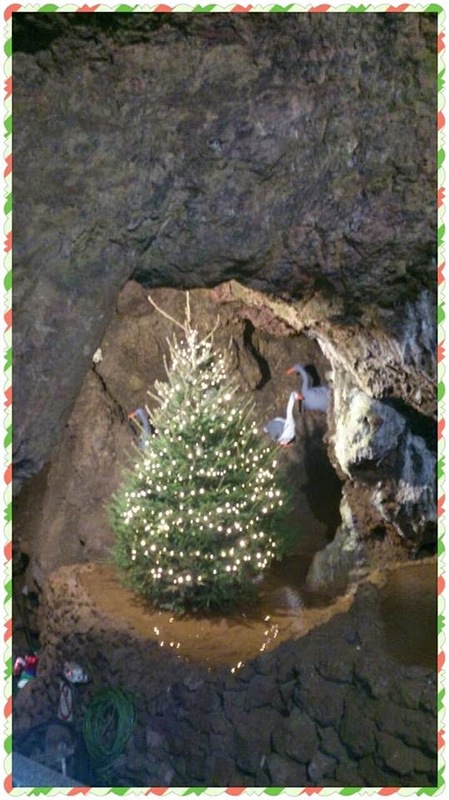 Each year at Clearwell Caves they put on the story of "The perfect christmas tree". 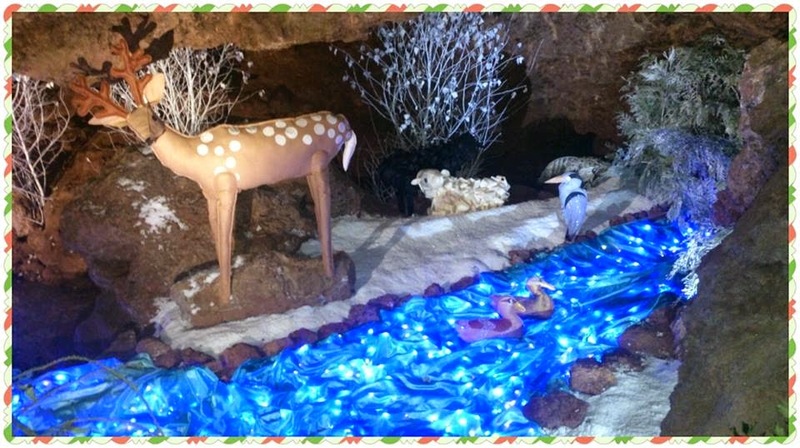 The caves are decorated, illuminated and tell a magical christmas story for all to enjoy. Santa is also hidden among the caves for you to pay a visit mid way through your walk around the caves. James loves caves so we knew he would love the visit and the added bonus of Santa was sure to see him in excitement over drive lol! We certainly were not disappointed either. As we entered the caves it was great to see all of the authentic machinery and tools used back when the caves were used for mining and it was great to tell James a little bit about it. As we ventured further in to the caves the story began. The story is written on boards next to lit up displays which consists of large rag doll type figures, large illuminated trees and lights as well as other stuffed toy characters and effects. James loved hearing the short bits of story that went along with the displays and it meant we spent a nice long while looking around the caves without James getting bored. There was also no tour guide or time limit in the caves so you could spend as much or as little time as you liked looking round, I thought this was fab especially with little ones who sometimes like to spend more time in one places than others. The displays were beautiful and you could really tell that a lot of effort and time had gone into each and every one. 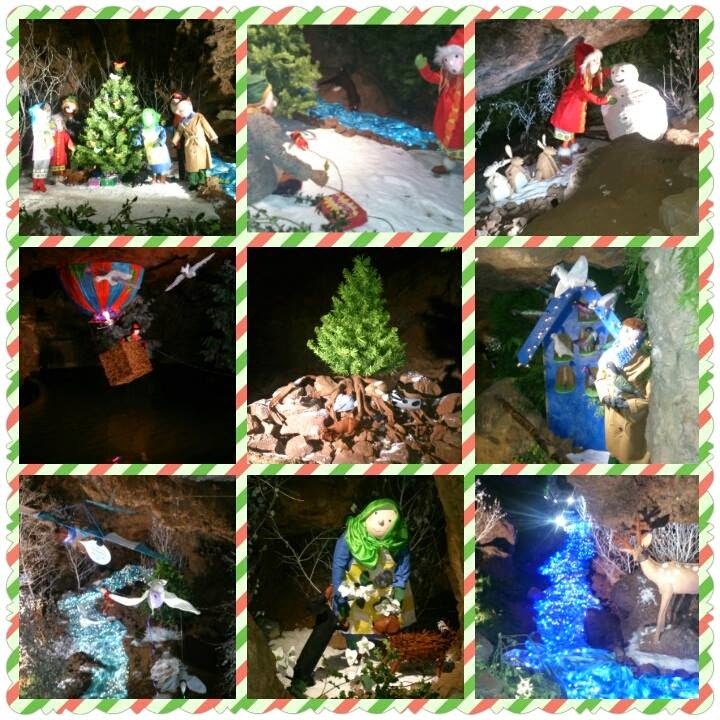 Parking is free at Clearwell Caves and the price to enter the caves during Christmas time is £9 per person. Babies under 2 go free or you can pay £4.50 for them to get a gift from Santa. We arrived just before opening time at 10 am and there was already a small que however it quickly went down and both the que to get in and the que for Santa were well organised and went down quickly with minimum waiting time. James and Evelyn both loved seeing Santa and much to our surprise there were no tears from Evelyn and James told Santa all that he wanted for Christmas, they both sat with Santa for a lovely photo and small chit chat. 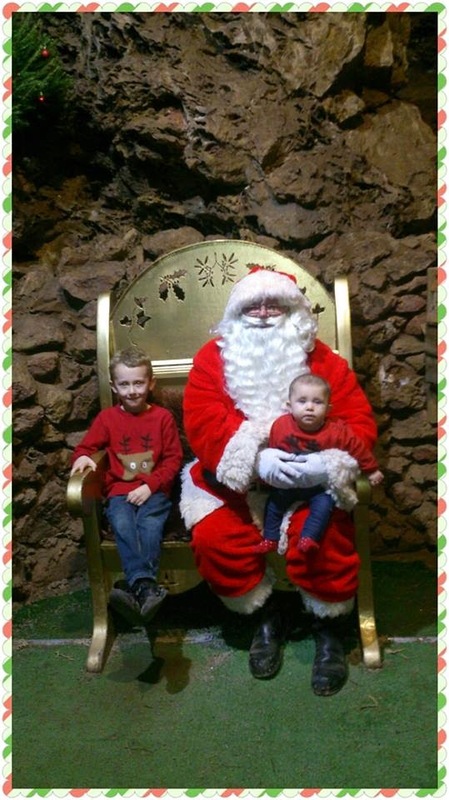 You are able to take your own photo of the children with Santa which I think is fab as it means no extra hidden costs and you can take several photos as you please. After visiting Santa the children could then head over to a small market type stall loaded with gifts and choose a gift of their choice. I had mixed thoughts about this is I thought it was a great idea they got to choose a present they would like, However I did think it took away a little of the magic of receiving a wrapped "surprise" present directly from Santa. James loved choosing his own present though! Inside the caves is also a small Christmas market and cafe. We didn't visit these as we had young children with us however the Christmas market stalls looked lovely and filled with some fantastic gift ideas, Christmas decorations and keepsakes. Overall we thoroughly enjoyed our visit and the caves and Santa were fantastic! 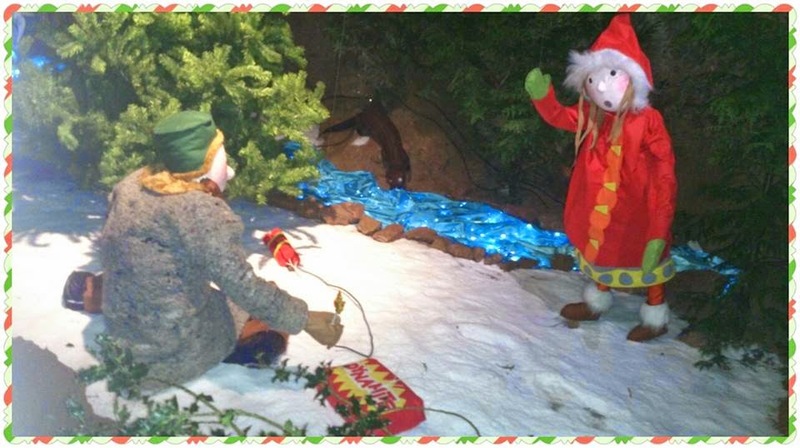 If you are looking for a Santa to visit or something to keep the children occupied for a few hours in the run up to Christmas I would really recommend trying out Clearwell Caves! Have you taken your children to visit santa this year? Love the deers in your photo. I am not sure about choosing unwrapped gifts either, the surprise of it is the magic bit.